On June 5, 1898, Aguinaldo issued a decree setting aside June 12 as the day for the proclamation of Philippine independence. At the same time, he commissioned Julian Felipe, a composer from Cavite, to prepare a composition which would be played during the independence ceremonies. 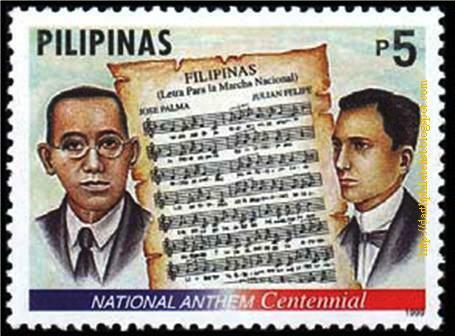 On June 11, Felipe showed Aguinaldo the draft of his musical composition, which was entitled Marcha Filipina Magdalo. Aguinaldo and the other revolutionary leaders, upon hearing the composition played on the piano, adopted it as the official march of the Philippines. Felipe changed the title of the march to Marcha Nacional Filipina (Philippine National March). On June 12, 1898, the music band of San Francisco de Malabon played it for the first time during the unfurling of the Filipino flag at Kawit. The beautiful melody of the anthem stirred the people's patriotic fervor. For more than a year, the anthem remained without words. Towards the end of August 1899, a young poet-soldier named Jose Palma (younger brother of Dr. Rafael Palma) wrote the poem entitled "Filipinas". This poem expressed in elegant Spanish verses the ardent patriotism and fighting spirit of the Filipino people. It became the words of the anthem. At last, the national anthem was complete -- with music and words. Alab ng puso, sa dibdib mo'y buhay..
Lupang hinirang, duyan ka ng magiting.